Muffin Break has turned an April Fool’s prank into reality, deciding to add scorpion to its menu options. Originating from an April Fool’s Day joke, on 1 April 2017 Muffin Break tried to trick its customers on social media by saying scorpion would be its newest flavour option. Muffin Break was however unexpectedly inundated with requests asking for scorpion to become a real menu choice. 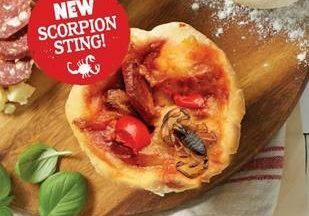 As a result, Muffin Break has decided to sell a ‘Scorpion Sting Pizza Pie’ at its store in Sydney’s Entertainment Quarter on Wednesday 12 April 2017. The pizza pie is 50 per cent pizza, 50 per cent pie, and includes smoked scorpion baked into the crust. The Scorpion Sting will be available only between 11:am and 2:00pm. Natalie Brennan, Muffin Break Head of Corporate Brand Support, said Muffin break was overwhelmed by the reaction to its April Fools’ prank. “We always value feedback from our customers and after receiving such an overwhelming positive response via Facebook from those eager to try the new flavour we felt it was only right that we followed through and brought this to life,” she said.